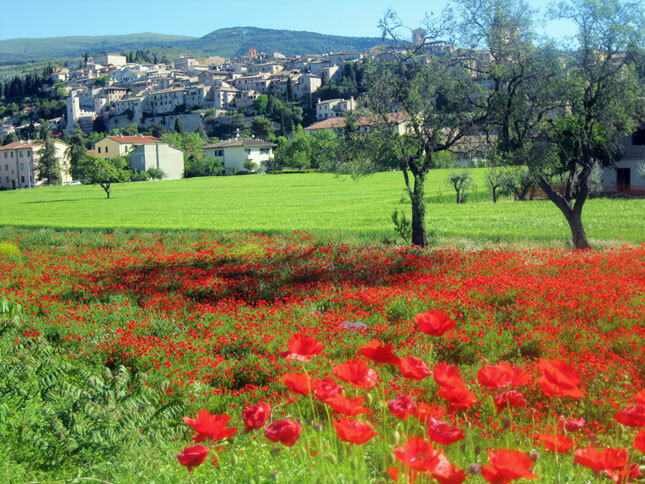 Enjoy your stay in one of our comfortable apartments – but do get out, too, to explore our town as well the hilltown wonders of Umbria, northern Latium, Tuscany, and the Marches. How long to stay? A lifetime. Pino and I have been discovering Italy’s wonders together for over thirty-five years and we’ve barely scratched the surface! Our Umbria, “Italy’s green heart” is wondrous all year round: read about each month in Umbria on the CALENDAR page. I do hope you will stay long enough in the Assisi area to explore at least the Umbrian hilltown highlights, ie, the hilltowns indicated in red in my notes which follow. A thirteenth-century historian wrote of the Basilica di San Francesco: “no more beautiful monument to the Lord has yet been built.” Frescoed with the greatest frescoes in the world of the late 13th-century and early 14th- century, this three-level Basilica built to house the body of St. Francis of Assisi leaves one open-mouthed. Far more than one visit is needed. A couple days are needed just for Assisi’s monuments and many more to discover all the hidden wonders of the backstreets.And you’ll need to take time to meet a few of our “locals”. 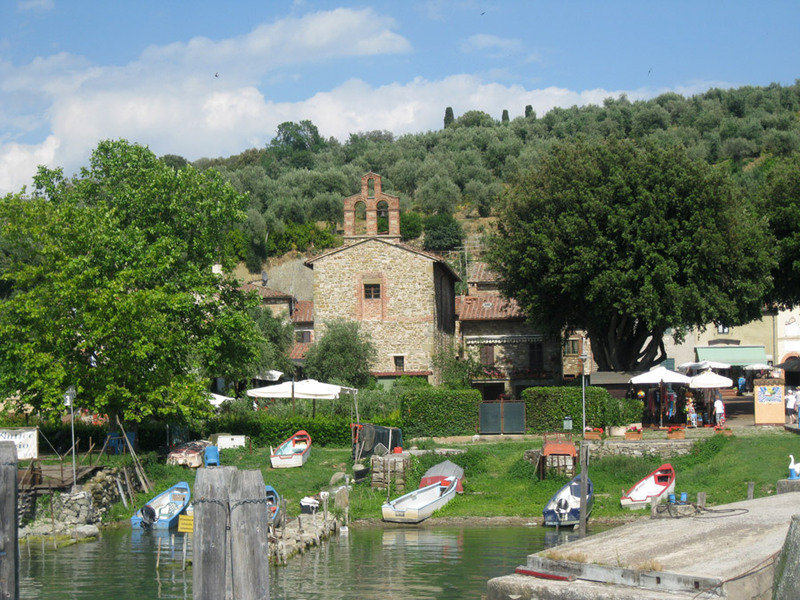 I’ll tell you all about the best places to taste Umbrian cuisine and savor our prized wines, as well. 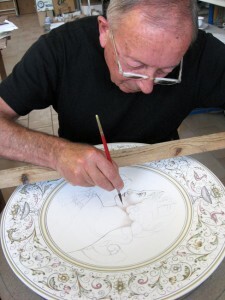 The artisan work of the Assisi area tempts visitors: olive wood, textiles, ceramics. Many artists live and work in our town, too: ceramic artisans, artists of watercolors and oil, print-makers, terracotta artisans, book-binders. Happy to connect you! 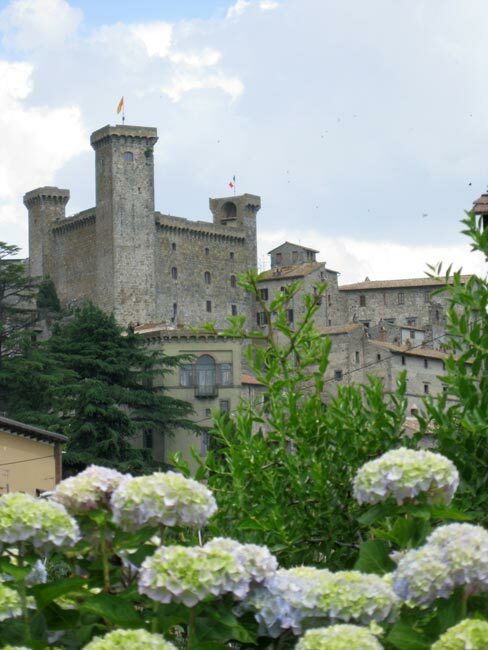 Our medieval May festival, Calendimaggio, is not to be missed. Joining the Italians to pay homage to Francesco, patron saint of Italy, on October 4th, his Feast, is memorable. Christmas in Assisi is unforgettable. Good Friday Assisi celebrations are most moving. 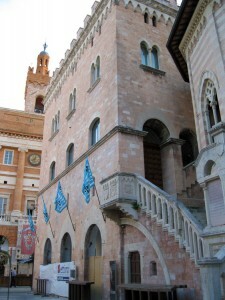 Easter week in Assisi is rich in festival events and charming Easter traditions. 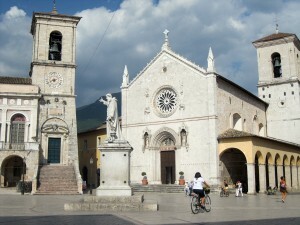 Corpus Domini (a moveable feast) is memorable in Assisi. 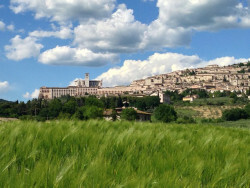 Like Assisi, nearby Spello is built in the pink limestone of Mt. Subasio which backdrops both of these medieval hilltown gems. Great Renaissance artist, Pinturicchio, frecoed masterpieces in the Spello cathedral but modern personalities are leaving their marks on Spello, too: inspirational Franciscan friar, Brother Paul (who has lived a contemplative life alone for over twenty years), Elvio who paints masterpieces on the detached plaster from ruined farmhouses, naif painter Paolo, textile artisan, Paola, and Roberto and family who offer over-the-top wine-tastings and olive-oil tastings. Spello’s backstreets enchant, especially from spring to late summer, when in full flower….and don’t miss nearby Collepino (pop. less than 20)! Sixty days after Easter for the Feast of Corpus Domini, the Spellani create over eighty astounding floral tapestries to welcome the Host (Christ) carried by the bishop throughout the winding medieval alleyways of the town. The Infiorate festival of Spello must truly be seen to be believed. The early Romanesque churches, the 1st-c. A.D mosaics of the Roman baths, an 18th-century jewelbox of a frescoed theater – to name a few – certainly make Bevagna worth a visit.But so do Simone’s cooking at his wine-cellar restaurant, the simple baked goods of the Polticchia family, the tasting of pecorino (sheep’s milk) cheeses and Umbria’s top prosciutto, capocollo and more with Rosita and Marco at their famous butcher shop. 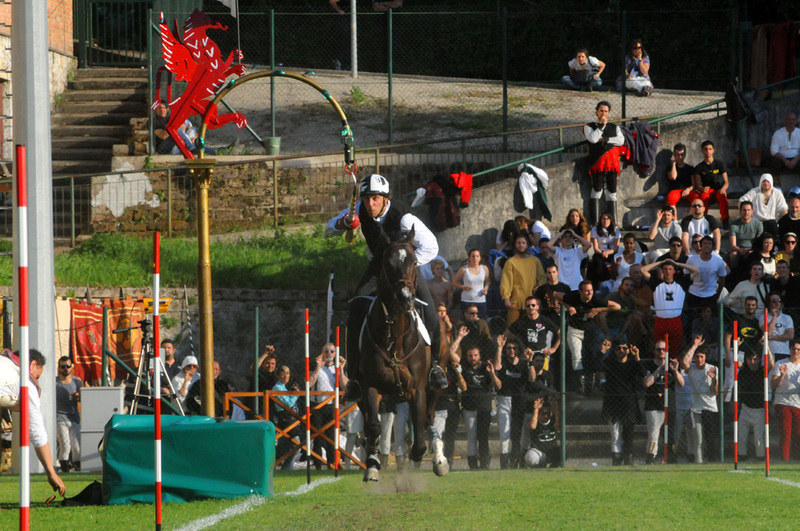 For ten days at the end of June, the Bevignati relive the Middle Ages con passione. Called “the balcony of Umbria”, medieval Montefalco overlooks rolling hills of olive groves and vineyards where the famous Sagrantino grapes are cultivated. 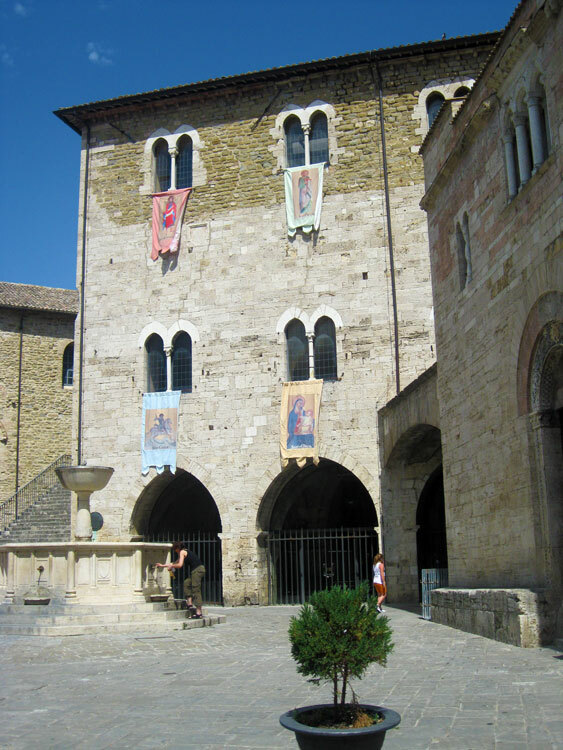 Famous for its wines and textiles, Montefalco also boasts a superb art museum, housed in a 13th c. Franciscan church as well as an Augustinian convent with astonishing relics of the town’s 14th-century Saint, Clare of Montefalco. Delightful restaurants along the main street tempt the visitor. In September, the Montefalco Wine Week festival animates the streets and piazzas. 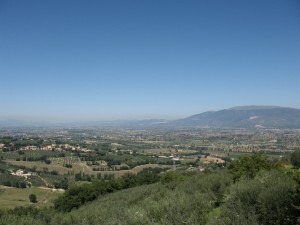 At the end of May, drop into the Montefalco wineries in the surrounding countryside during the “Open Cellars” festival. Bulls run not only in Pamplona, but also in Montefalco – in August when la Fuga del Bove festival takes over the town. Not many tourists head to Foligno, simply because there is so very much to see in Umbria and other better-known towns (and yes, more lovely, too) draw the visitors. 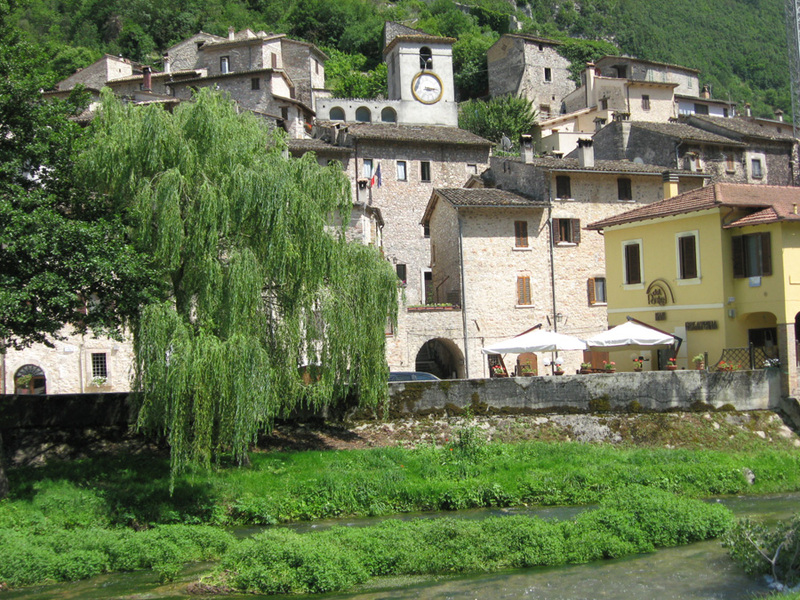 But if you’ve already visited Bevagna or Montefalco or Spello and you’re on your way to Spoleto, make a stop. If you have a free day in Assisi, hop a train for the 25-minute ride to Foligno. Always an important rail center for central Italy, with repair and maintenance yards here, Foligno was heavily bombed by the Allies in World War II. The regular street plan of the center is evidence of its Roman origins though very little remains of its ancient past and only traces of its medieval history – but a most splendid one: Palazzo Trinci. 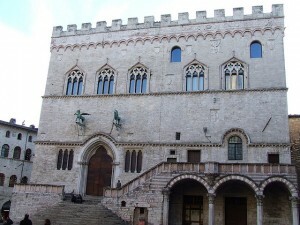 Residence of the noble Trinci family of Foligno from the 14th- century to the mid 15th- century, the palace houses an archaeological museum and the civic picture gallery. The façade was redone in Neoclassical style after the early 19th-century earthquakes. Palazzo Trinci houses splendid frescoes from the early 15th century, some attributed to Gentile da Fabriano. In the hills near Foligno, the recently-restored Benedictine abbey of Sassovivo is worth a visit. In June and in September, the splendid Baroque festival la Quintana, transforms the city – and the people – who relive their 17th-century past with full passione. In late October/early November, Trevi celebrates the “new” olive oil, just-pressed. Between Trevi and Spoleto, just off the SS75, a highway cut-off leads through a tunnel into the Valnerina, where forested rocky cliffs rise in majesty above the Nera River. Scheggino, Preci, and Visso (in the Marches region) are charming Val Nerina medieval towns, each offering “hidden” secrets to the visitor. Sant’Anatolia di Narco, Ferentillo and San Pietro in Valle (11th-century frescoed abbey church) all entice. The Valnerina is not to be missed! 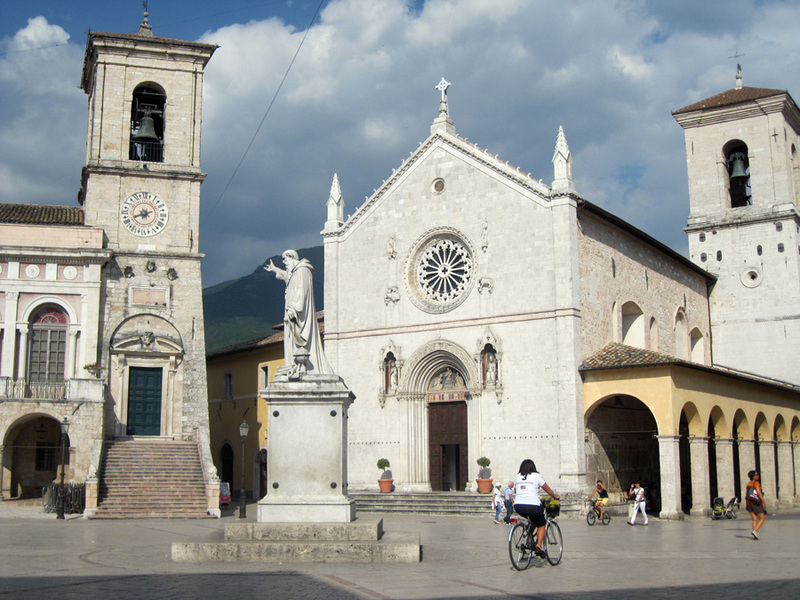 Norcia celebrates the Feast of patron saint, St Benedict in late March with a variety of festivities. 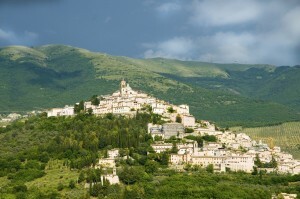 Birthplace of 15th-century saint, Rita, Cascia, is tucked away in the mountains, not far from Norcia. Cascia is in full festive mode for the Festa di Santa Rita, May 22nd. 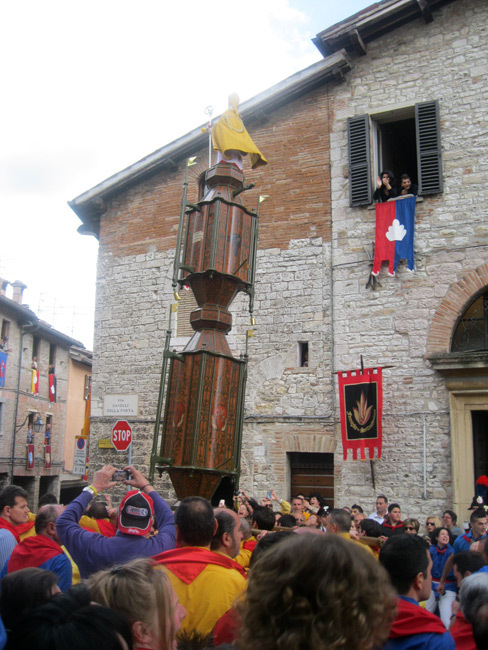 Cascia is also famous for its saffron, celebrated in a late October festival. 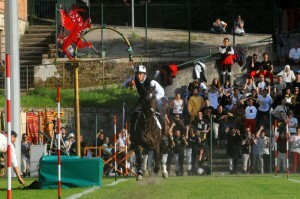 During La Corsa dell’Anello in mid-May, the Narnesi once again iive their medieval history – and with what passione! Not far from Narni, Amelia is most noted for its two-kilometer section of pre-Roman “cyclopic” city walls, made of massive blocks of cut stone. In the town archaeological museum, the town proudly displays a 1st-c. AD fine bronze statute of the emperor Germanicus, unearthed in the 1960’s during the construction of a mill. Wander the charming backstreets in this quiet Umbrian medieval town, as yet quite “undiscovered”. In January, the city celebrates one of its patrons, San Costanzo. 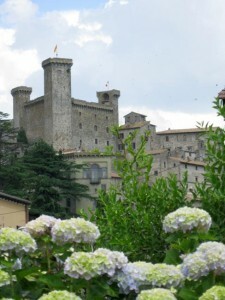 Citta di Castello north of Perugia off the E45, is a less-visited Umbrian medieval town, famous for an international horse race in September and the white truffle festival in November. The international horseshow, la Mostra dei Cavalli, draws visitors from all over the world in mid-September. The truffle festival in early November is not to be missed. 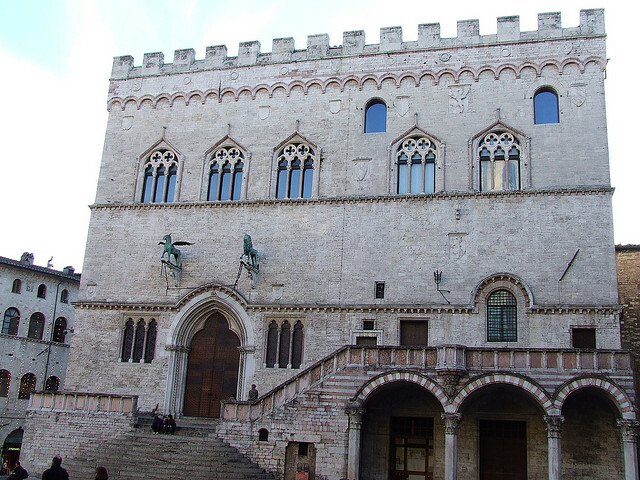 Birthplace of Perugia, teacher of Raphael and one of Umbria’s most famous Renaissance painters, Citta’ della Pieve, northeast of Perugia, once was a fortified castle. The municipal buildings date from the 13th to the 16th century and the town’s main festival, il Palio dei Terzieri, brings to life once again the city’s past. The monumental crib scene in Palazzo della Corgna at Christmastime is not to be missed. On Easter Sunday and Easter Monday, i Quadri Viventi (“living images”) bring to life the episodes of Christ’s Passion and death. Gubbio commemorates its forty modern-day martyrs on June 22nd. 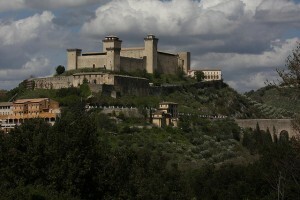 On the way back to Assisi from Gubbio, consider a stop in Gualdo Tadino, to visit the imposing fortress, la Rocca Flea. At the end of September, Gualdo Tadino brings to life the 15th-century folklore in honor of St. Michael the Archangel with three days of festivites, high point being the pageantry in Renaissance dress – and the donkey races! Small town near Gualdo Tadino, San Pellegrino comes alive the night of April 30th with a most amazing race. 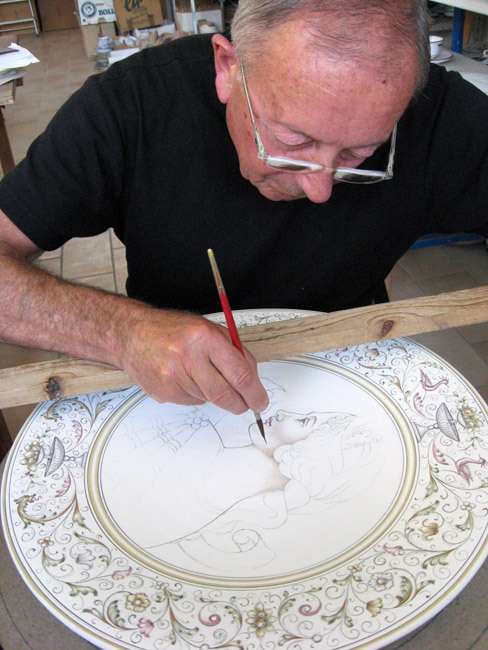 For centuries, the maiolica artisans of Deruta (south of Perugia) have been creating intricately-designed ceramic masterpieces. A shrine outside the town astounds visitors wtih a fascinating display of hundreds of maiolica folk-art masterpieces dating from the mid-seventeenth century. Todi merits a stop on the way to Orvieto. Enjoy a cafe’ or gelato or just people-watching while sitting at an outdoor cafe’ in the main piazza, facing the cathedral and surrounded by the crenellated medieval civic buildings. A couple of interesting churches deserve stops, as well. 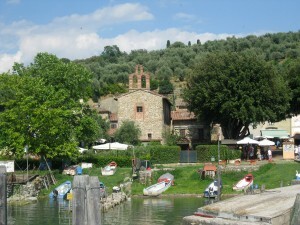 Titignano, once a feudal castle, is a charming tiny village off the road between Todi and Orvieto. If you have time for a stop, do enjoy a lunch here of Umbrian specialties. 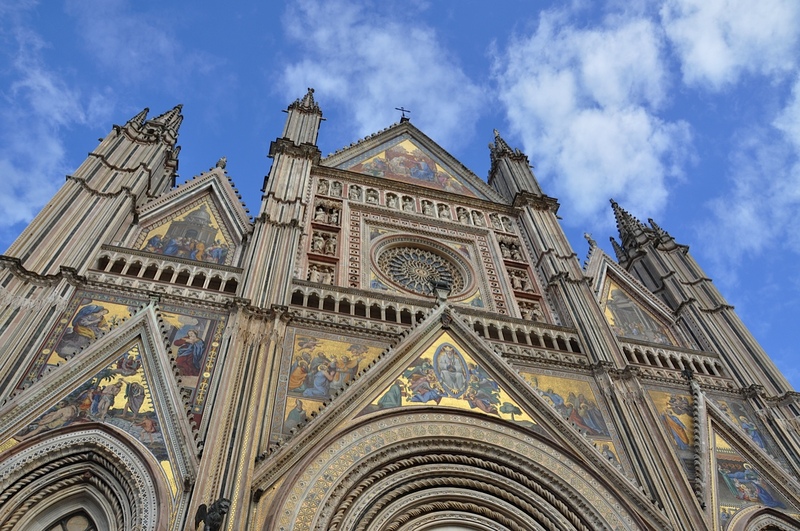 Evidences of Orvieto’s Etruscan origins live on in the tombs surrounding the town and in the fine Museo Faina just opposite the stunning black and white-striped cathedral. The Renaissance fresco masterpieces of Luca Signorelli are not the only treasures in the Duomo, as you’ll see…. 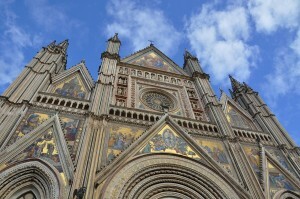 Orvieto trumpets in the New Year with world-class jazz when the Umbria Jazz Winter festival takes over the town. The stories of the martyrdom of Bolsena’s patron saint, Santa Cristina, animate the town in July.